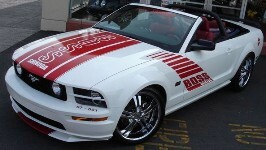 Team Shinoda builds a whole set of Boss Shinodas for 2007 in both coupes and convertibles. They have the 429, Legacy, Level 1, Level 2-S, Level 2-T, Level 2-FR, and the Level 3. The packages contain different body kits, interior trim, wheels, and badging.